heelman500 had the most liked content! When I bought my first boat, the surveyor (A pretty decent chap) did warn me that a boat is just a hole in the water into which you pour money. And to be fair he was quite right, though I can see how the costs associated with a narrowboat, compared to London housing prices could be attractive. I'm now into caravan breaks in my static at "Sunny" Blackpool.... Almost forgot its CBB on channel 5..... and apart from the usual mindless drivel from z list Americans .... there are usually some nice heels to be spotted.... as wellas the ever pleasing to the eye Emma Willis. Freddy, The mooring costs alone would be astronomical.... I've seen old scrappers of narrowboats (Worth <£10k) sell for a price in the £50-60k because they had a residential mooring and then you had up to £1000 per month mooring fee! I did think about central Manchester but lack of power/water provision and quite expensive moorings ruled it out. This is probably one for Freddy but all comments welcome, I have ordered a 3700 mm wide x 3000 mm deep x 2450mm high lean to self build conservatory!! i was wondering how deep to go with the base foundations, andis it a major problem going over the sewer pipe, though there is no manhole on my property. i was thinking a 300 mm trench with 150 mm for the floor slab, any ideas?? 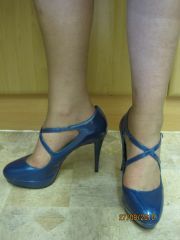 Now these are really really nice boots, youve got to have really thin calves to get in these, but the effect is superb! Probably the best heel pic I have ever come across..... I only wish I could get into a pair! yes I thought you might like that pair! Freddy I quite like the pair in pic 5 of the first set, quite nice block heels! This woman most certainly likes her high heels! Well I dont know what to make of these! might go down well in Somerset at the moment!